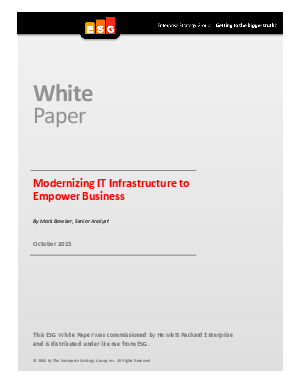 The ever-rising tide of demands on IT organizations is creating constant pressure on their leaders to upgrade or replace their outmoded legacy systems with new infrastructure technologies that will allow them to keep pace with the speed of business. It is no longer sufficient to manage basic business applications and resources such as ERP, email, and silos of heterogeneous data. The bar has been raised higher than ever, and the role of IT is evolving to meet it. As a result, IT must support applications and services that make it possible for the business to provide new, diverse customer experiences while generating expanding revenues via the emergent crown jewels of business: big data, cloud, and mobility.